Over the past few months I've been running weekly polls in the right sidebar. The questions are generally random. If anything joins them together it's that the results are uncertain and that the answers are subjective, with no right or wrong results. My motivation for posting them is simply curiosity. Almost four years after retiring his popular blog, Soth still wields considerable weight online. C'mon people, information wants to be free. These haven't seen the light of day yet but it seems only a matter of time. This poll comes from the Wingogrand quote: “Every photograph is a battle of form versus content. The good ones are on the border of failure.” And from the Wonder Twins: "Photography Activate! Form of..." Personally I tend to shoot for form over content, but against my better judgement. This poll was meant to get at the root of documentary process. When recording an event of great personal significance, which type of photo will be most meaningful to future viewers? Portraits (Arbus) or Moments (Winogrand)? I'm still torn. As pure photographs I think nothing compares to Winogrand, but as penetrating records of fact maybe it's Arbus? Friedlander was just thrown in to match the poll to the 1967 New Documents show at MOMA. Actual winners: The Bechers, Wessel, Jr. 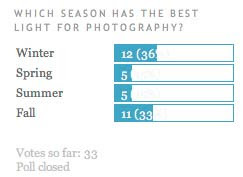 I think these results tell more about B's readers than about the photographers. I don't tend to attract the pro-Becher crowd. Sure they're overrated but give them props for major influence. I figured someone like Schott or Deal would be underrated just because you never hear about them in contrast to the others who've all gone on to be big players. Maybe 10 years ago Wessel could've been called underrated but by now he is pretty widely respected, so I don't really understand this result. OK, you're all a bunch of cheap bastards. Proudly including myself. A reference to the 1978 exhibit and book which followed. The longer I plug away at photography the more convinced I am that it's all mirrors. I don't mean a house of mirrors, but I think it's impossible to take a truly "objective" photograph. Every photo is in some sense a self portrait. Even someone like Shore whose photos are seemingly as dry and mechanical as possible winds up creating a body of work that is, at its root, about him. In retrospect this question wasn't very well crafted. The answer was too predictable. What I want to know is who the heck walks around with an 85 mm? This result is rather depressing. Photography seems to have gained strength steadily through the decades until the 1970s, after which it's fallen off a cliff. Part of the result may be that the 1990s are still too fresh to analyze. I plan to conduct a followup in 2050 for proper comparison. I thought of this poll while shooting in recent summer weeks. Here it is bright and warm and seemingly ideal for shooting, yet the light is dull and listless for most of the day. Sort of counter-intuitive. Maybe Winter is better? The light is active and angular, but it only seems to last a few hours, and keeping cameras out of the rain is a hassle. By the time Spring rolls around I'm usually pretty well cocked and ready to go after a Winter indoors. 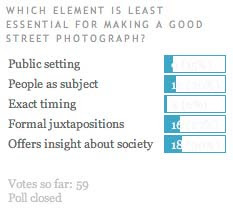 I thought of this poll while skimming HCSP, which I've come to view as a representative sampling of current street photography tastes. It struck me that every single photo in the pool uses people as subject matter. At the same time I'd noticed a steady trend in my own work toward shooting less people. It made me wonder, how necessary are people in street photos? And for that matter, how necessary are other ingredients? Personally I think street photography can happen anywhere, in a private room shooting mis-timed dust mites if necessary. I get the sense this is not a commonly shared view. This is a sort of rephrasing of the Mirrors/Windows question, but when put in sexual terms the answer becomes more obvious. You forget to give an option "none" or "other" for the people that don't like the choices you put on the polls. Now I am in doubt how many votes would have the alternative option. In the poll about influential people maybe none or other would have a 40 percent if you give to the readers that chance. Ok, in the case of The practice of making photographs most closely resembles ..., maybe would be an strange option other. But that can give you the kind of readers you have. some thoughts on 7/6 poll.... you could probably write a thesis on this query ... even though 'interesting' is very subjective... I suspect that the results correlate closely to the readerships' ages and when they were turned on to imagery that lead to eventually ,or coincided with, making of their own. Interesting comments on the poll. Honestly I don't remember exactly which one I voted (Arbus, 28mmm ...) but I would probably be mainstream here. There are several interpretations of the 1970s poll but I prefer the simplest: It was a damn good decade of photography. Regarding the "none" option, it might work for some polls but I think generally it is too much of an easy out. The more the choices are restricted the more interesting the results. Of course the answers are limited and arbitrary but that's part of the poll design. You're forced to fit into a slot which is perhaps uncomfortable and that can lead to a revealing decision. Still upset there were no women included in the first poll. No Laurel Ptak? No Rachel Hulin? No Jen Bekman?!? Holy crap, man, all she did is is upend the gallery system and transform the way photographs are sold. The photo blog world is such a sausage party. Regarding street photography and HCSP, we intentionally have gone with the a very clinical definition over the years - "candid photographs of strangers in public settings." Deviating too much rattles the crowd too much. But to me, and most of the other regulars, street photography is more about an ethos or philosophy rather than a dogmatic interpretation. I look forward to your 2050 poll Blake. Interesting question about the age of the commenters. Maybe that would be a good poll. I assumed that most were in their 30's and that they are mainly in to 1970's style of American street photography and the New Topographics. Ha, Schott told me at the LACMA opening he pretty much stopped taking photos after the original show. Funny he placed so high but maybe that's because no one is passionate with disdain for him like with the Bechers.